Even though Willowmore is considered as the Western Gateway to the Baviaanskloof Wilderness Area, a World Heritage Site, Willowmore is a worthwhile destination in it's own right. It offers visitors numerous experiences such as hiking, mountain biking, 4x4 trails. It is also a popular plains and small game (such as wild pig, kudu, springbuck) hunting destination. In town and the surrounding area guests will find lots of things to do and exceptionally friendly people. You will find a number of restaurants coffee shops, 4x4/4x2 tracks, hiking trails, mountain biking routes, bird watching as well as historic sites. Read more below. During the Anglo-Boer War Willowmore was in British territory, but several Afrikaans speaking men from the Cape Colony joined the Boer "army" in the north. The Colonial rebels from the Cape Colony were regarded as traitors and rebels by the British authorities, and many were executed after the war. A few skirmishes took place around Willowmore and the Boer "army" even invaded the town, but the term "army" is a bit of a misnomer for the Boer forces as it consisted of citizens of the Boer republics (Orange Free State and Transvaal) who willfully enlisted in an untrained "army". Their style of warfare was more guerilla like than the conventional style of the British forces. Boer commandoes remained active in the Willowmore-Aberdeen area for more than a year. On 15 December 1900 a few Boer Commandants from the north crossed the Orange River with approximately 700 men and entered the Cape Colony. On 11 January they had a skirmish with Lt Col J H G Byng near Murrays burg. One of the commandos under Commandant Gideon Scheepers then moved away and on 15 January they invaded Aberdeen (about 125Km from Willowmore). On 18 January the Scheepers commando reached Willowmore and occupied the town. This lasted for just over a month until 27 February when Colonel L W Parsons' troops chased them out of the Willowmore district. The Boers then tried to capture Aberdeen, but the town guard's defenses were too good, so they retreated into the mountains near Aberdeen. 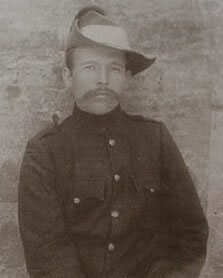 Scheepers and his men were active until he became too sick to fight and surrendered to Captain Shearmann of the Hussars on 11 October 1901. 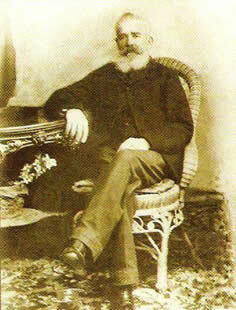 Scheepers was a member of the Free State Artillery and not a Colonial Rebel. It was thus very controversial that he was trialed and executed as such. He was executed 18 January 1902 by firing squad in Graaff-Reinet. It has been argued that it was because of his successful raids over such a long period that the British wanted to get rid of him in this manner. It is also puzzling why his grave has never been found. 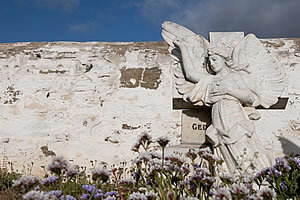 Seven others who were also executed were later reburied in Graaff-Reinet on 1 December 1908, but it was claimed that Scheepers' grave could not be found. More information about the Anglo Boer War and Willowmore can be found here. 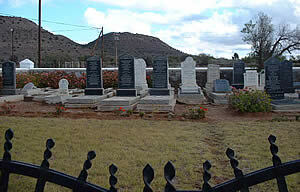 This old Boer graveyard has interesting graves dating back to the Anglo Boer War. Most graves stones were recently restored to their former glory and the old fashioned marble headstones are a must see. 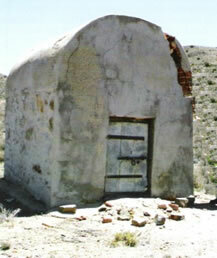 From here, you can take an easy walk to the small gunpowder chamber which was used to store gunpowder and ammunition. In 1961, it was used by a construction company for storage of dynamite during the building of the bridge. There are also remnants of British forts just outside town. 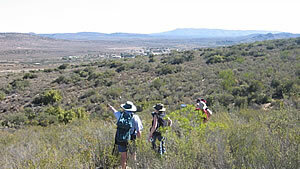 See the section about the Pierre Ferreira Trail below. This hiking trail will take you through beautiful Karoo veldt which is rich in succulents. 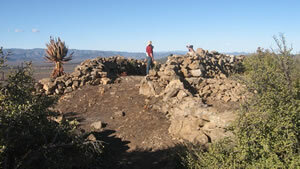 The circular trail passes two old historic forts dating to the Boer War. These forts where uses by the Willowmore Town Guards in 1902 to guard over the building of the railway line to Willowmore. At the time, the area was full of "Boer Rebels" who threatened to blow up the railway line. While doing this easy 2-3 hour trail, (preferably early in the mornings or at late afternoon), you will be charmed by the panoramic views of the village and surrounding area, thus experiencing the Karoo in a truly unique way. 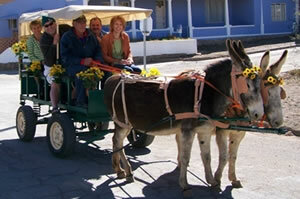 Take a trip down memory lane while you relax and enjoy a peaceful donkey cart ride through the streets of our village. The trip takes about 15-20 min. 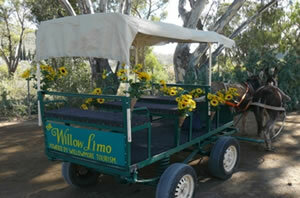 The Willow limo can be found in the main street so treat yourself to some fun and laughter. After your ride you can feed the two much loved donkeys, Patrys and Bessie. 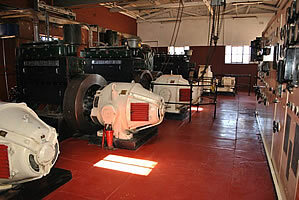 Before Willowmore had Eskom, this power station supplied the town with electricity until 1984. There are six Lister Blackstone diesel generators that were shipped from England and then came up by rail to Willowmore. The largest engine is still in working order and uses 5 liters of diesel in 15 minutes. The Blackstone's is open to the public and the key can be collected at the Baviaans Tourism Office. This 9 hole golf course is situated on the outskirts of town. The total length is 5980 meters, (grade 72). The greens are grass but the fairways are ground. You can use a piece of artificial grass to place your ball on. This in itself is a challenging experience. The club house is fully licensed. Visitors are welcome to enjoy a good day of golf in un-spoilt surroundings and afterwards relax with the local players. 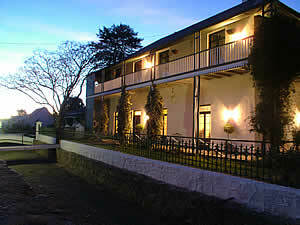 The Karoo town of Willowmore on the N9 is regarded by many as little more than a drive through spot. Fortunately (for them) there are some people that know better and allow themselves to experience the hospitality of this town. Today Willowmore is one of the cleanest towns in South Africa and there is an ongoing beautification program in place which will surprise visitors. 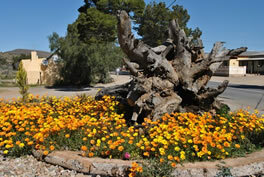 This project of Baviaans Tourism includes gardens on public open areas in the town as well as a tree planting project. 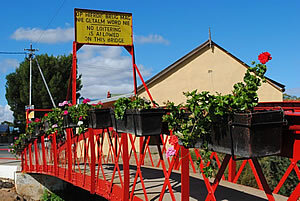 The iconic "Rooi Bruggie" was erected as a PEDESTRIAN BRIDGE over the Noodsloot and was used by pedestrians when the river was in flood. The road did not have a bridge and was a drift/ford at the time. As recently as 10 March 2010 a flash flood hit Willowmore that turned the noodsloot into a torrent and flooded a part of the main street. Aasvoëlberg or "Vulture Mountain" overlooks Willowmore and the district. There is a road going all the way to the top and is accessible with a normal 2x4 bakkie. It is one of the few places in the Karoo where you can find proteas and other fynbos species as well as succulents. The sandstone rock formation on the mountain is a must see. The panoramic view from the top of Aasvoëlberg is breath taking and you just realize how much beauty you are surrounded by. The area is also rich in bird life and the Cape Sugar bird is often sighted. A small fee is charged for entrance. Contact Joanne Kroon at 044 - 923 1801 / 0827 835 389 for the key. The Shepard's Tree has 3 stems coming up out of the ground. Two of the stems have joined each other, forming an "eye of a needle" and the 3rd stem has grown through the eye, forming the "thread" thus wonderfully creating an "needle and thread effect". This "Wonderboom" was discovered as early as 1906 when the road was made between Willowmore and Aberdeen but it was only when the road was tarred in 1961, that it received more attention and was acknowledged as a wonder of nature. 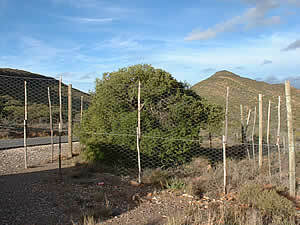 It is situated ± 10km outside of Willowmore on the N9 towards Aberdeen. 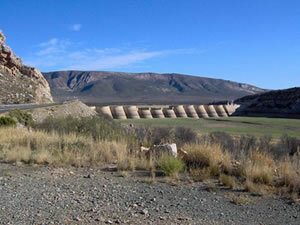 The dam was build by the South African Railways in 1906 to supply the steam locomotives with water. 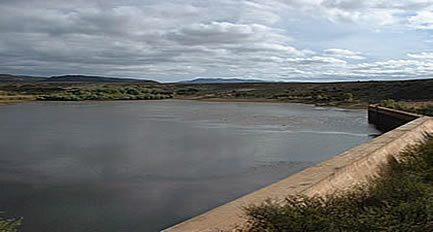 When steam was replaced with diesel the dam was taken over by the then Willowmore Municipality as the town's primary source of water at the time. Problems with algae in the water resulted in the establishment of an alternative system of interconnected boreholes and fountains on farms in the area. Bird watchers will spend hours at Bakers Dam since bird life abounds. The key to the dam area can be obtained from the Tourism offices. The dam never stays full for any length of time since it is a flood control dam and not for irrigation purposes. Whenever the dam receives enough water, the sluices are opened to make water available for irrigation on a rotation basis for users downstream. In recent years it has been noted that less and less water flows because the annual rainfall has dropped in the catchment area. Beervlei Dam remains, however, a very interesting attraction for those who travel the main road that passes so close to the curious, fluted wall construction of the dam. The picnic spot just below the wall remains a favorite stopping place for the passer by. The old Jewish Graveyard is well maintained and can be visited by prior arrangement with the Tourism office since the gate is kept locked. 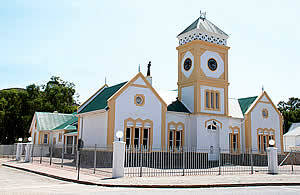 The Town Hall: It is believed that the town hall was built around 1896. It was used for a variety of functions, including funerals of prominent people, soirées, plays, wedding receptions and film shows. 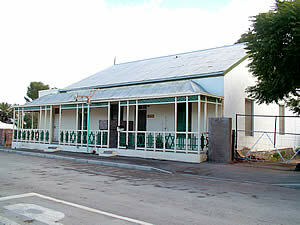 The house which used to belong the the town's rabbi is a typical example of Karoo and Willowmore Architecture. At one stage Willowmore had a thriving Jewish community and so a synagogue was erected. The building is no longer in use, but can still be viewed from the outside. 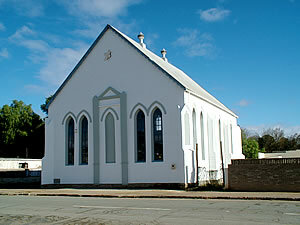 The erf was purchased for the building of a synagogue in 1906 and the foundation stone was laid on 8 April 1907. The Jewish community applied for a loan for the building in 1908 and by 1917 the Willowmore Hebrew congregation had 30 members. Eight years after it's establishment in 1856 Willowmore was growing at a rate that justified a Dutch Reformed congregation. Yet before even considering a proper church, a spacious parsonage was erected for the first minister, Dominee P.N.Ham who arrived on the ship Brasilië from Holland. He only stayed for two years, and was superseded by Dominee George Murray, brother of the famous missionary Andrew Murray. He at least got a church, that was inaugurated in 1878. Originally the pastorie was a single story dwelling, but because it also had to be used for school classrooms and other functions, it soon became too small. Accordingly, in 1897 they added another floor on top, at a cost of 750 pounds - R1500 in current values. These extensions also offered enough overnight space for church members who had to travel from far to attend nagmaal, for at the time such communion services often lasted for a whole week. To fit everybody in, wooden room dividers were erected where needed. When a new parsonage was built in 1940, the church decided to give the old place to the local school who used it as a girl's hostel. Many changes were then made, but luckily nothing structurally that could have marred the beauty of the Victorian architecture. Still later the old dwelling became a real country losieshuis, catering for borders who needed a just a room and some meals. This venture did not last long, and the place again changed hands, this time to Mr. D. Gellman, a Jewish merchant who used it as a store for his union seed, potatoes, skins and other agricultural products. In the early seventies Sonny Goullee, a surveyor that came from Kenya bought the fairly neglected old dwelling and changed it back into a comfortable and pretty family home. He kept it in good condition, making sure that the unfired clay brick walls, corrugated iron roof, Victorian architectural adornments, yellowwood top story floor and the other Oregon pine woodwork were always very well maintained. 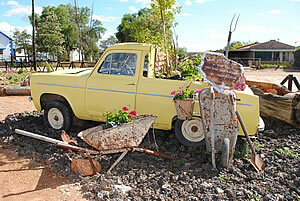 Tours of Willowmore will illustrate life in a typical Karoo Town. 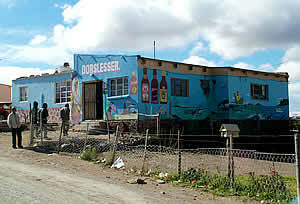 In the townships Shebeen's are popular gathering places.